Best Waterproof Sunscreen For Sensitive Skin – Top 5 Picks! Sunscreen is critical to ensuring skin health when enjoying the great outdoors. It’s been proven to help reduce sun damage and the risk for skin cancer. For people with sensitive skin, choosing a sun block that is effective and non-irritating can be a challenge. 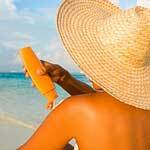 Lotions, balms and oils made for soaking up rays can encompass products designed for tanning with sunscreen with lower SPFs to waterproof sunscreen for kids.